by Brianna Crandall — November 30, 2018 — Teknion Corporation, an international designer, manufacturer and marketer of innovative workplace interiors, just announced the introduction of Tek Vue — the company’s new glass office-front wall system and latest architectural interiors product offering. We designed Tek Vue in response to our customers’ requirements that increasingly emphasize aesthetics, simplicity and value. Our new glass office-front system responds to these essential needs of today’s workplace. Tek Vue focuses on single-center glazing and thin-profile frames, while providing effortless integration with conventional building construction and existing Teknion wall programs. Tek Vue wall and door programs are built on the concept of a universal platform, which re-envisions how a system can be specified, planned and installed within the evolving and fast-paced world of interior architecture and construction. Tek Vue is positioned to provide a unique blend of attributes found in demountable partitions and conventional glazing systems. Horizontal profiles are only 1 3/8 inches thick x 2 1/2 inches high, and house single-centered 10mm or 12mm laminated or tempered glass. These frame profiles, as well as wall starts, door frames and transitions, provide independent building site accommodation and integration with conventional construction. In addition, Tek Vue is designed to integrate with Teknion’s Altos and Focus wall programs, leveraging their existing functionality to create more comprehensive workspaces. The pivot door program offers a single universal frame that houses a frameless glass, framed glass or solid leaf. Each pivot door leaf affords different levels of acoustic and visual privacy at varying price points. Pivot doors provide easy installation, a high level of adjustability and more integrated finishes when compared to traditional hinge doors. Tek Vue pivot and barn doors share similar hardware options for visual consistency across the storefront when required. Hardware is always specified separately from the doors to optimize delivery and installation time. 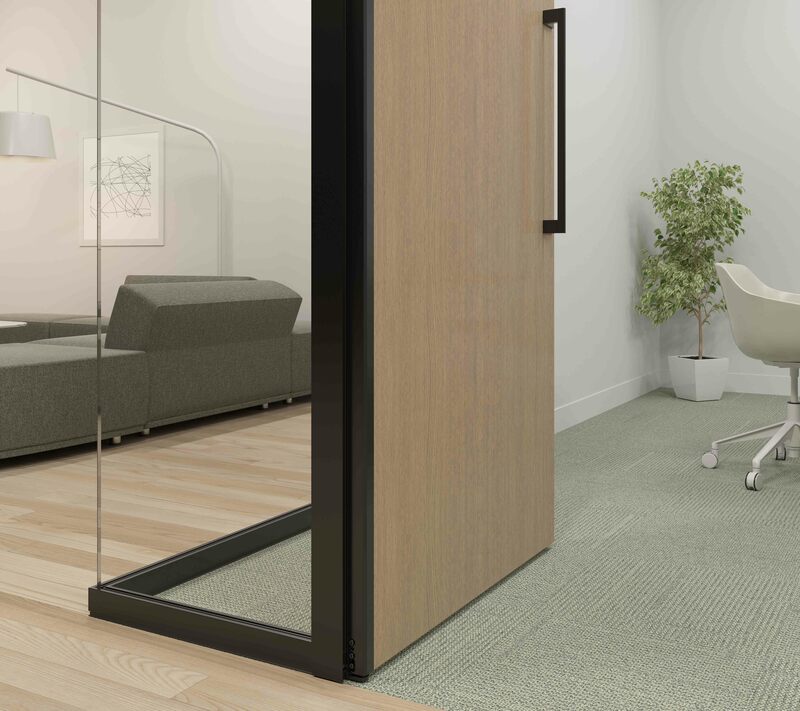 Both door programs have been future-proofed to allow advanced hardware and door leaf options to be added at a later date, ensuring the continuous evolution of the product line. For more information about the Tek Vue wall system, visit the Teknion website. You can also find more FM-specific information on the company’s FMLink ad. Teknion provides a versatile and integrated portfolio of office furnishings, seating, ergonomic accessories and architectural products that support workplace wellness. If you want to visualize your interior buildout plan and get an accurate budget beforehand, see JLL’s new workplace planning software and service May 16, 2018 In "Products and Services » Software & Technology"
Open areas too loud? Now you can add low-maintenance sound-absorbing panels from Rockfon to your walls August 3, 2018 In "Products and Services » Building Products"
Design for aging and dementia: A new paradigm in research-based design August 16, 2018 In "Magazines » FMJ"